One of the pet-peeves of many gun-lovers is when someone refers to a loaded round of ammunition as a “bullet,” or when someone refers to a magazine as a “clip.” I’ve had similar feelings in the past when someone has referred to our pieces of brass by a term other than the one I was most familiar with. 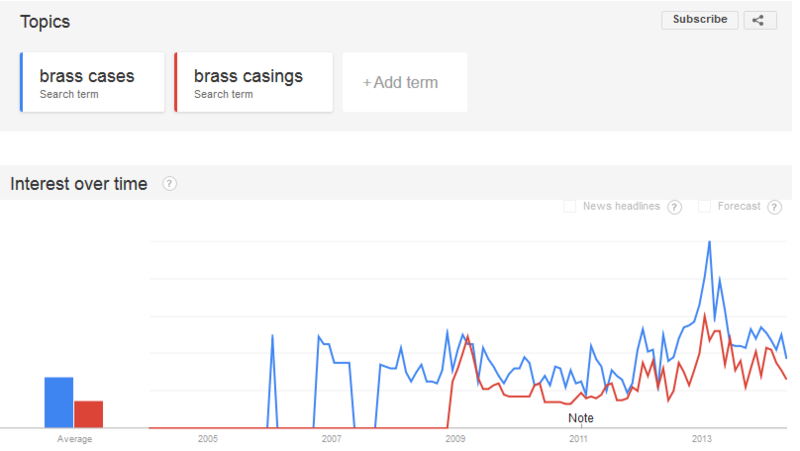 I’m speaking, of course, about whether they should be referred to as “brass cases” or “brass casings.” We’ve seen grown men almost come to harsh-words over what they should be called, so we thought we’d investigate a bit seeing as we probably say one term or the other at least a few hundred times a day in our office. For the purpose of the discussion here, I’ll just call them “pieces” only to avoid confusion between the terms. First things first: I don’t believe there to really be a functional difference, but I’m sure someone will prove me to be wrong on this one, and when someone does I’ll edit this part out immediately to destroy any record of my not being infallible. 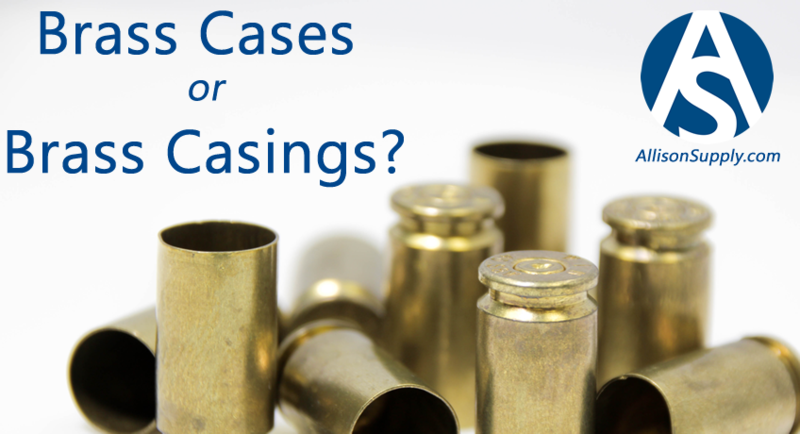 The Illustrated Firearms Dictionary by Morris L. Hallowell IV uses the term “case” over 40 times to refer to these brass pieces, while only using the term “casing” once when referencing the same. 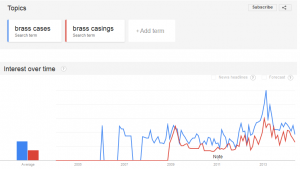 When looking at the brass manufacturers, most use “case” more than they do “casing,” but with the exception of Starline (who uses the term exclusively as far as we can tell) everyone uses the term “casing” at least once or twice in their marketing materials when referring to the pieces. 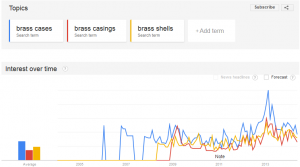 There is a whole separate group of people who refer to the pieces as as “brass shells” (A rather large group when looking at the graph of interest! 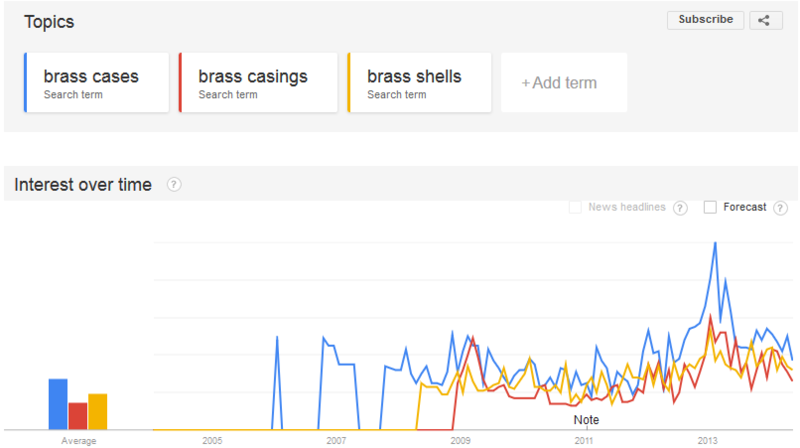 ), but I’m going to hope that most of those people really are looking for brass shotgun shells rather than our brass cases/cartridges. While I’m sure it is also technically correct, I don’t want to further confuse the issue! With apologies to New York and Pennsylvania, those two states really like using “brass shells” so I’m left to just assume that it is something peculiar to being Dutch? Either way, tomato/tomato (Both of those are still spelled the same, right? ), we’re ok with whatever you want to call them. If you think we’re wrong in our preference, or have some other evidence as to why one is absolutely correct, do let us know! I submit that with the multitude of mixed abilities it is of no great development that the use of words migrate towards a common subset from which all of us can derive some meaning. As a language evolves, cases can merge (for instance in Ancient Greek genitive and ablative have merged as genitive), a phenomenon formally called syncretism. denoting a verbal action, an instance of this, or its result. denoting a verbal action relating to an occupation, skill, etc. denoting material used for or associated with a process, etc. For me the answer is obvious, grammatically we would use the word CASE as a proper noun, and CASING when referring to the act of using said item per the above definitions. This would also mean we would need to add the priming, powdering, leading or bulleting, to the list of associative words alongside CASING. As a side note, I am a mere 52 years young and spent 25 years serving this country. I admit my tour was shy of the West Coast, I spent many years between New England and Louisiana. About as broad a dialect as you could ask for in a population. The only time I heard the use of the word CASING was whether I wanted my sausage in a natural CASING or not. I believe that you may have solved this case(ing)…. I have lived in New England all my life and I always called loaded ammo “shells” and brass cases “brass” and bullets “heads”, and empty shotgun shells “hulls”. Don’t know where we got the terminology from, but I have been loading for 46 years and that’s what I always called them and at the gun shop, they always knew what I was asking for and I was never corrected. I think it’s a regional thing, like we call them Subs, you call them Hoagies, and they call them Grinders. I guess the only thing that matters is that we get all the “right stuff” and reload our own. Course finding all the components is a lot harder these days.